turn your mess into a success without the stress. Purge, sort and organize your life. Let us declutter and improve your home and life in the Greater Houston Area. 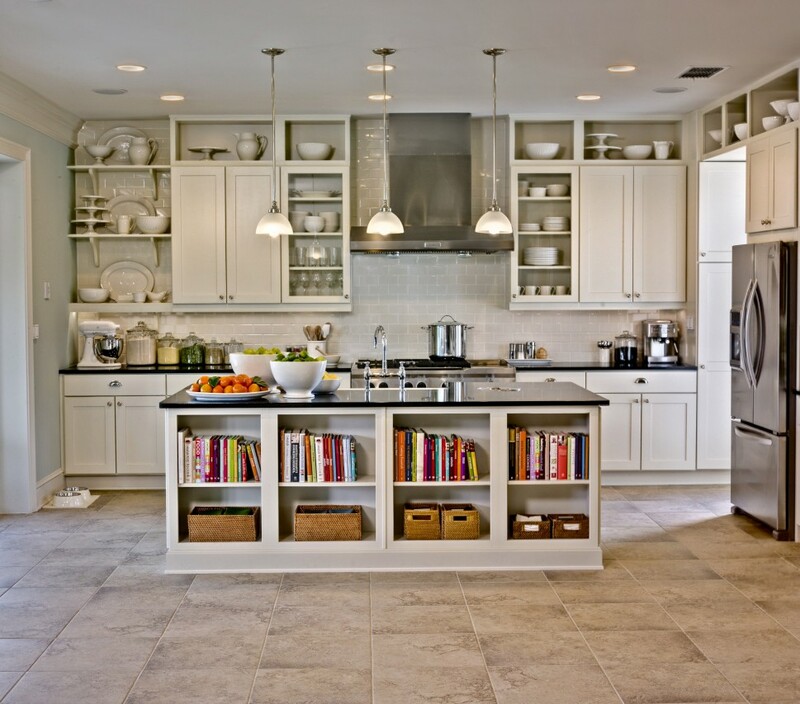 Let us organize your spaces, then work to create a system it stays organized and decluttered with little effort. We will develop and implement a system which works for your individual needs. Our services can organize your workplace and, more importantly, develop an easy-to-maintain system that WORKS for you. A Guest Room Worthy of a Guest. This homeowner decided to convert her basement into a rental unit so everything from downstairs had to be moved onto the main floor, mainly being shoved into the guest room. One of the homeowner’s issues was using her dining room as a dumping ground for life and, when people were coming over, sweeping it all into large bins and moving the bin into the guest room. Ultimately, we shredded three banker boxes of old bills and statements and purged a six cubic feet of “stuff” for the community yard sale. 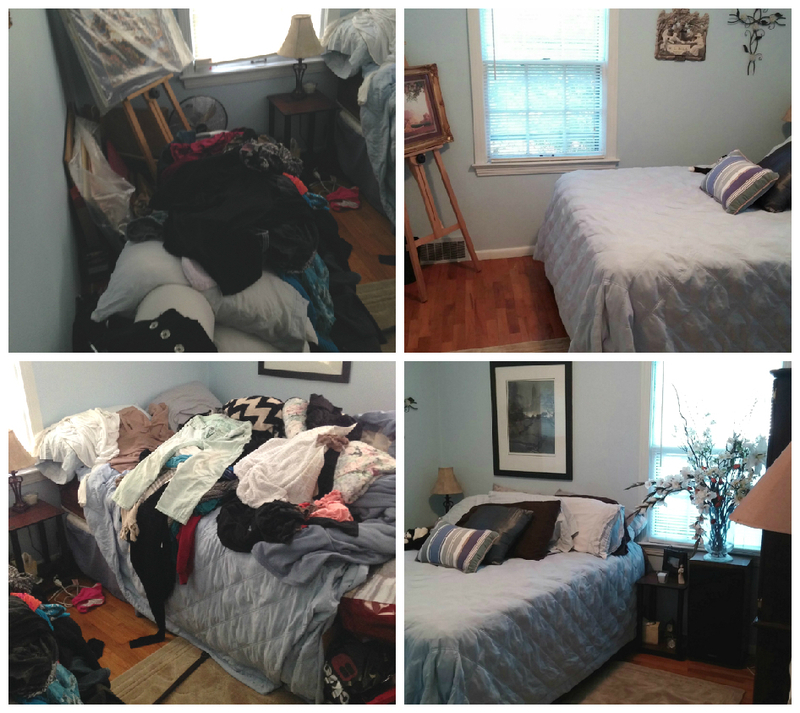 In fewer than eight hours, we were able to transform this space into a usable guest room. Many of us have weight fluctuations and feel the need to keep clothing in a variety of sizes. In addition, this client has lived in the same house for 16 years and had this mindset: The moment I get rid of it is the moment I’ll need it. These three factors worked together for a massively over-stuffed closet. We began by removing clothing (I couldn’t even get in the closet for photos before doing so) and focused on separating wardrobe into “work” and “casual” and by seasons. To combat the weight fluctuation, we decided to keep items which currently fit and a few basic items in one size larger and purge all out-dated smaller sizes. This allows the weight loss to be rewarded with new clothing. 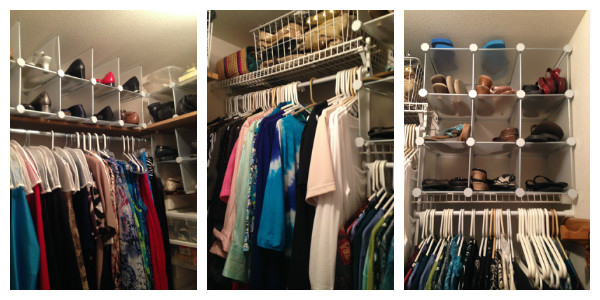 All items not necessary in daily wardrobing were removed from the closet to find a more appropriate home. This is your chance! Let’s organize your spaces! Did my closet in one session! I can now move the coat hangers on the rod and fit all of my shoes in my closet!!!! Plus now my husband gets to use part of it, too! I have used Meredith’s organizing services multiple times over the last 10 years, and cannot say enough positive things about her ability to not only compartmentalize my areas in a functional layout, but to also make it easy for me to continue with the organization after she is finished!